CGP-115. 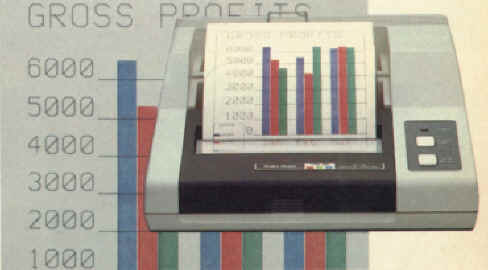 It’s hard to believe that the small, inexpensive CGP-115 Color Graphics Printer can be so versatile. Measures just 2 15/16 x 8 1/4 x 8 1/2” and weighs only 1 3/4 pounds. You can create a variety of graphic output from charts to computer-generated ‘doodles”. Prints in red, blue, green and black on 4 1/2” wide paper. Drawing and plotting is simplified with CGP-115’s built-in commands. Text mode prints 40 or 80 characters per line at 12 characters/second — ideal for program listings and output. Software controls additional character-sizes and rotation. Uses easily replaceable ink cartridges. Color Pens. One each: red, green, blue. Roll Paper. 41/2” wide, 150-ft. long. 26-1428......Pkg. of 3/7.95 SPECIFICATIONS. Plotting Range: X-axis — 3 13/16 inches (480 steps), Y-axis — no limit. Plot Speed: 2 1/16 inches/sec. Print Speed: 12 characters/sec. Characters/Line: 80 or 40 (text mode). Any size from 1 to 80 per line (graphics mode). Power Requirements: 120VAC, 60 Hz, 23 Watts. Pens are now parts RSU 10274850 and RSU 10274868 but are not easy to find. The Atari 1020, Commodore 1520, Oric MCP40, Sharp CE-150/515P/516P/1600P and TI HX-1000 used the same pens as did the PC-2 Printer accessory. Paper is 4 1/2" wide, 2 3/4" diameter. Try POS supply houses, or even large office supply firms.